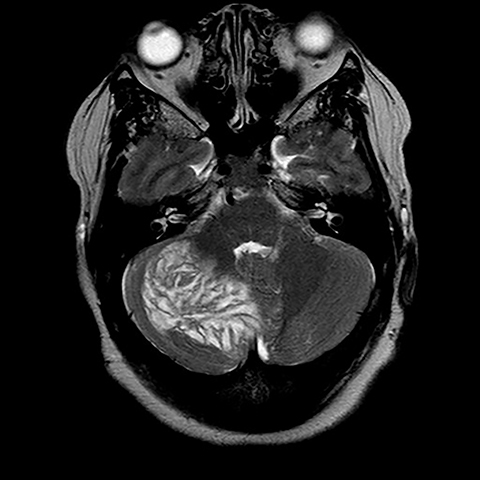 A 33-year-old female presented to the emergency department with the chief complaint of new onset severe headache, persisting for five days, with accompanying subjective intermittent ataxia. There was no relevant history of prior migraines or similar such sentinel events. Review of systems was noncontributory. CT imaging demonstrated a nonspecific hypodense mass centered in the superior right cerebellum with mild locoregional mass effect upon the fourth ventricle without evidence of obstructive hydrocephalus. 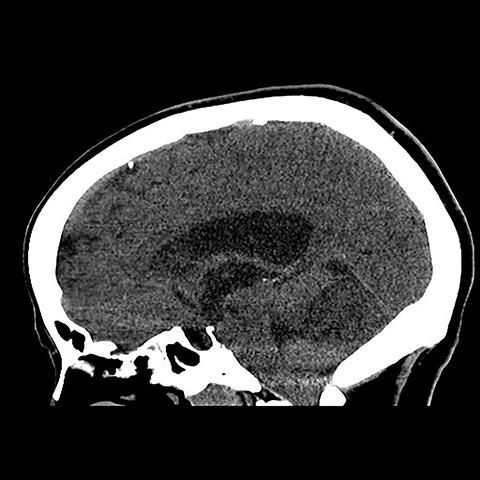 The appearance was nonspecific and considerations included subacute infarct, infiltrating glioma or cerebellitis. 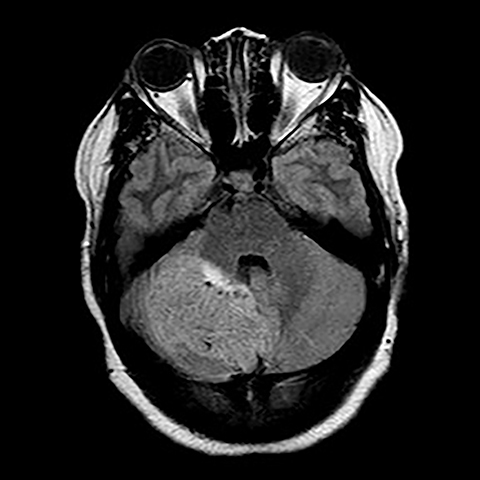 Subsequently, MRI was performed, demonstrating the characteristic striated morphologic appearance of dysplastic gangliocytoma or so-called Lhermitte-Duclos disease. Given the prior relevant surgical history of thyroidectomy for goiter and subcutaneous lipoma resection, the findings were felt to be in conjunction with previously undiagnosed Cowden syndrome. The patient was discharged after symptomatic pain control and scheduled non-operative follow up with neurosurgery as an outpatient. The relationship with Cowden syndrome is both clinically relevant and pertinent as well due to the heightened predisposition in these patients for a vicissitude of both benign and malignant neoplasms involving the breast, thyroid, dermis, gastrointestinal, genitourinary and central nervous systems, with annual surveillance and screening measures being highly warranted. 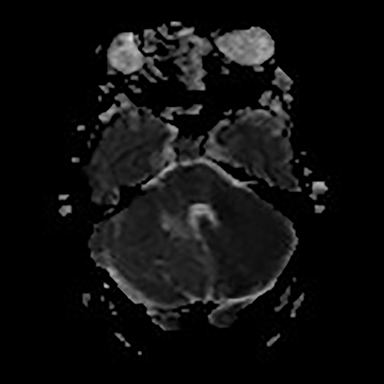 Lhermitte-Duclos disease, so named for French neurologists Jacques Lhermitte and P Duclos after their initial description of the entity in 1920, has undergone a spectrum of growth in pathophysiologic understanding recently and is now considered to be a dysplastic gangliocytoma of the cerebellum, a WHO grade 1 tumor.1 Growth is slow and there is no reported malignant potential with clinical presentation typically entailing signs of increased intracranial pressure, obstructive hydrocephalus, and cerebellar dysfunction.1,2 The MR imaging appearance is considered diagnostic and can obviate biopsy, consisting of a tigroid, striated appearance of the nonenhancing cerebellar mass with superficial bands of alternating T2 hyper- and isointensity to grey matter, iso- and hypointense on T1-weighted imaging, with sporadic calcification reported and minimal loco-regional mass effect.3,4 A strong association with Cowden syndrome, an autosomal dominant, multigenic group of germ line mutations, is now recognized. Due to the heightened risk for a host of potential neuroectodermal related malignancies associated with this phakomatosis, patients are advised to undergo appropriate targeted annual screening and surveillance. As such, the radiologist may play an important role in first suggesting the underlying syndrome based on initial neuroimaging findings. 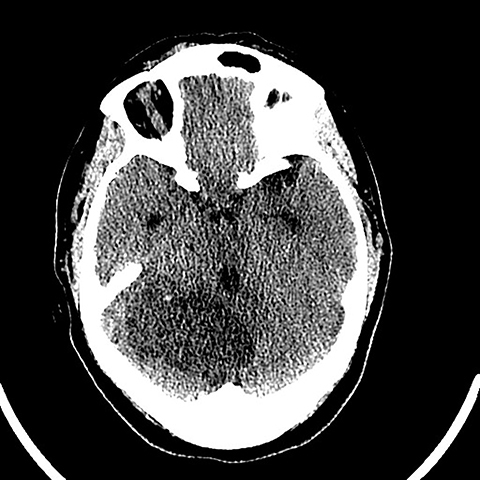 Our patient, a 33-year-old female, presented to the ER with a five-day history of severe headache and subjective dizziness and ataxia. There was no prior history of prodromal symptoms or migraines and review of systems as well as laboratory data were noncontributory. Surgical history was notable for a prior thyroidectomy for benign goiter and previous subcutaneous lipoma resection. Noncontrast CT imaging of the head performed in the ER demonstrated a roughly 6 cm mass centered in the superior right cerebellar hemisphere with cortical involvement and mild mass effect upon the fourth ventricle. A solitary punctate superficial focus of hyperdensity was seen, deemed equivocal for focal hemorrhage or dystrophic calcification. No obstructive hydrocephalus was observed (Figures 1-3). 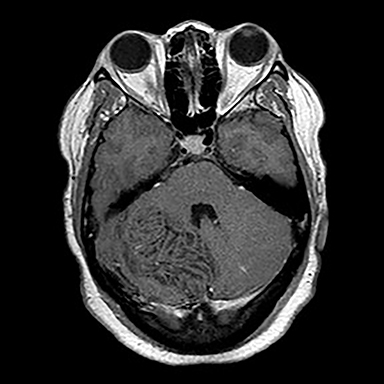 Diagnostic considerations included glioma, subacute infarct or, less likely, cerebellitis. MRI was ordered for further elucidation and proved definitive, demonstrating a focal mass centered in the superior right cerebellum with pathognomonic alternating bands of hypo and hyperintensity on T1 and T2 weighted imaging without restricted diffusion or enhancement. There was minimal surrounding edema and mild mass effect upon the fourth ventricle without evidence of obstructive hydrocephalus (Figures 4-8). The findings were deemed consistent with Lhermitte-Duclos disease. Because of the relevant surgical history and imaging appearance, suspicion for underlying Cowden syndrome was raised. 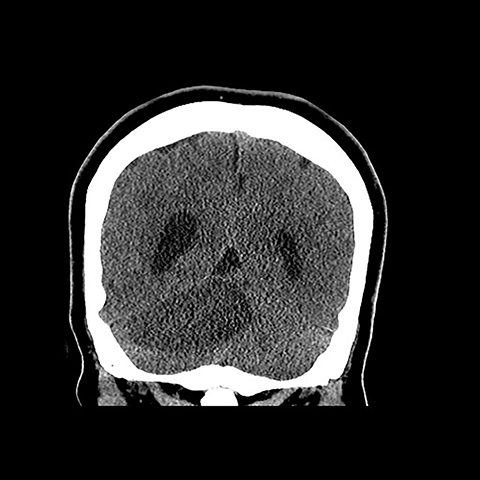 The patient was treated for symptomatic control of her headache, and, after multidisciplinary discussion, was discharged with follow up as an outpatient in the neurosurgical service for surgical planning and clinical surveillance. In summary, Lhermitte-Duclos disease, or dysplastic gangliocytoma of the cerebellum, is a pathognomonic radiologic entity, the diagnosis of which should remain not only in the bailiwick of neuroimaging specialists but general radiologists as well. Recognition of the underlying relationship with Cowden syndrome is paramount for both genetic counseling and timely patient induction into an appropriate clinical surveillance regimen. Hariri O, Khachekian A, Muilli D, Amin J, Minassian T, Berman B, Ritter Y, Siddiqi J. Acute-onset cerebellar symptoms in Lhermitte-Duclos disease: case report. Cerebellum. 2013;12:127-130. Yagci-Kupeli Y, Oguz K, Bilen M, Yalcin B, Akalan N, Buyukpamukcu M. An unusual cause of posterior fossa mass: Lhermitte-Duclos disease. J of the Neurological Sciences. 2010;290:138-141. Klisch J, Juengling F, Spreer J, Koch D, Thiel T, Buchert M, Arnold S, Feuerhake F, Schumacher M. Lhermitte-Duclos disease: Assessment with MR imaging, positron emission tomography, single-photon emission CT, and MR spectroscopy. AJNR. 2001;22:824-830. Shinagare A, Patil N, Sorte S. Case 144: Dysplastic cerebellar gangliocytoma (Lhermitte-Duclos disease). Radiology. 2009;251:298-303. Nowak D, Trost H. Lhermitte-Duclos disease (dysplastic cerebellar gangliocytoma): a malformation, hamartoma or neoplasm? Acta Neurol Scand. 2002;105:137-145. Kamble R, Mathew S, Rao R. Infiltrating medulloblastoma in a child mimicking Lhermitte-Duclos disease. J Pediatr Neurosci. 2012;7(2):159-160. 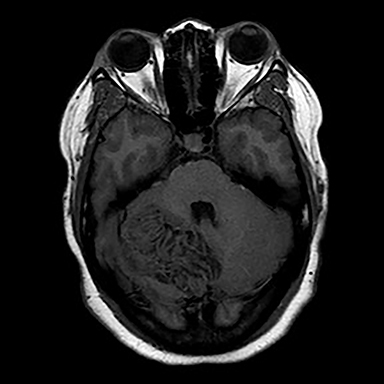 Douglas-Akinwande A, Payner T, Hattab E. Medulloblastoma mimicking Lhermitte-Duclos disease on MRI and CT. Clin Neurol and Neurosurg. 2009;111:536-539. Pilarski R, Stephens J, Noss R, Fisher J, Prior T. Predicting PTEN mutations: an evaluation of Cowden syndrome and Bannayan-Riley-Ruvalcaba syndrome clinical features. J Med Genetics. 2013;48:505-512. Pilarski R. Cowden syndrome: A critical review of the clinical literature. J Genetic Counsel. 2009;18: 13-27. Tutluer S, Tanriover M, Guven G. Cowden syndrome: a major indication for extensive cancer surveillance. Med Oncol. 2012;29:1365-1368. Rheinboldt, M, Delproposto Z, BlaseJ, Hakim B. Acute presentation of Lhermitte-Duclos disease in an adult patient in association with Cowden syndrome. Appl Radiol. 2016;45(8):28-31. Prepared by Dr. Rheinboldt, Dr. Delproposto, and Dr. Blase while Attending Staff Radiologists; and Dr. Hakim while a PGY 2 Diagnostic Radiology Resident in the Emergency Radiology Division, Department of Radiology, at Henry Ford Hospital, Detroit, MI.